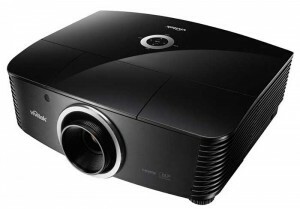 The Netherlands – A home cinema experience to remember is the dream delivered by Vivitek’s new H5098, a professional-grade projector for home cinema enthusiasts from a leading brand of visual display products. Comprising all that’s needed to create the big screen experience at home, the H5098 majors on both performance and flexibility – as well as Vivitek’s reputation for reliability and environmental-friendliness – to ensure a thrilling visual experience. Image quality is assured thanks to its Full HD 1080p resolution and 50,000:1 contrast features. The H5098 leverages DLP technology with BrilliantColor for accurate, long-lasting colour and improved efficiency in illumination optics to provide a wide colour gamut capable of creating over one-billion colour shades. Combined with its 2,000 ANSI lumens and RGBRGB colour wheel, the H5098 delivers the ultimate performance in video projection in just about any environment, albeit in dark or ambient light. This cinematic image quality is backed up by the H5098’s flexibility, as it can be installed on the ceiling with a choice of five different lenses, to cover the different projection throw ratio distances, making it ideally suited to designated cinema rooms in premium properties or for city dwellers in compact apartments. It can be incorporated easily into existing home cinema settings, while its centre lens with horizontal and vertical lens shift and quick touch lens release design further aids its easy installation. Film buffs will come to appreciate the enhanced viewing experience the H5098 offers thanks to its VividMotion frame interpolation function. This has been engineered to reduce motion judder to create a fluid and flawless video stream, providing a finely detailed viewing experience when fast paced movie-scenes or sports games are being enjoyed. For the home cinema enthusiast enjoying a 3D performance, the H5098 will pull you right into the scenes, even allowing 2D to 3D conversion to always guarantee the visual performance desired. As users have come to expect from Vivitek, the H5098 is highly flexible, enabling users to enjoy full HD resolution images from Blu-ray players or game consoles with dual HDMI ports to connect them simultaneously. DLP technology with BrilliantColor for accurate, long-lasting colour. Full HD resolution and 50,000:1 contrast ratio for vibrant and dazzling images. Enjoy great colour reproduction thanks to 6 segment RGBRGB colour wheel. Enhance viewing experience with Vivid Motion frame interpolation function, which reduces motion judder and provides a cleaner viewing of film. Great installation flexibility with five optional lens and lens shift capacity. Built-in 12V trigger for screen or blinds control.